The UK’s Alternative Finance Industry appeared to skip the Easter break with origination volumes in the month of March setting a new high watermark. £342.5m of financing was originated over the course of the month. This is a 12% uplift on February’s number and a 66% rise on the origination seen in March last year. This record month rounded off a massive quarter for the industry with £913m of financing originated, over £100m better than the previous high and tantalisingly close to the £1bn mark. Perhaps Q2 will see that milestone reached? Property secured lending was the most active segment with £176m of financing originated, bettering the previous high set just last month by some £49m. For the last 13 months, the top three platforms, Zopa, Funding Circle and RateSetter have swapped positions on the podium but never allowed any other platform into the top 3. However, this month LendInvest has managed to claw its way into the top 3 originators by volume, knocking Zopa off the podium. LendInvest originated £51.8m in March, £12m more than its previous biggest month which was Feb 2015. "We had known that March would be a big month for loans ever since the Chancellor announced that landlords and developers would have to pay extra stamp duty tax after 1 April. Property investors very sensibly want to avoid paying more stamp duty than they have to. They turned to us because they know the marketplace lending model can work quickly and efficiently - just like they needed it to. "Naturally we're delighted with how much our investors were able to lend against in March. 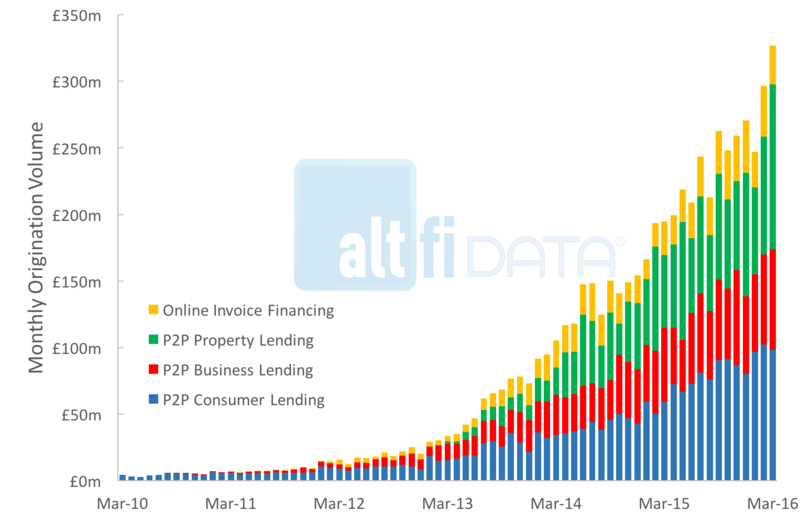 The nature of marketplace lending at this stage in its evolution means that lending figures will change month to month, but we're expecting substantial increases year-on-year over the rest of 2016." From Heroes to Zeroes. As we look back over the quarter, it is clear that the gap in origination volumes between the top 5 platforms and the smaller platforms is widening. Whilst the origination volumes of the top five platforms are on an upward trend, many of the smaller platforms' monthly origination volumes are moving sideways or even backwards. Three platforms – Money&Co, Proplend and Relendex are yet to report any loan origination in 2016. Rumours of a platform failure were highlighted in October last year by the Evening Standard’s Anthony Hilton. No platform was subsequently connected to those rumours as far as we are aware although there have been a few platforms moved away from retail peer to peer and ‘pivoted’ into other areas. It is interesting to note that Relendex and Money&Co have only launched one deal between them since the Evening Standard ran its article. Origination fees make up the bulk of peer to peer platform’s revenues, without origination, how long can these platforms survive before they have to turn the lights off? Watch this space.